Located at the western entrance of Thessaloniki, the second Greece's largest and historical city, with a commercial port of great importance for the whole area. 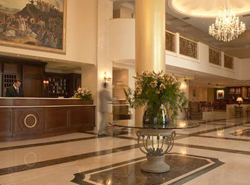 Grand Hotel Palace is the largest five star conference hotel in Thessaloniki. 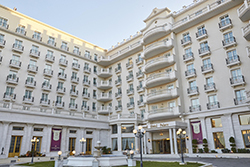 Its elegant design and the exceptionally modern facilities, create a unique cosmopolitan atmosphere. The 222 Deluxe rooms, 34 Executive rooms (at the 6th floor of the building), 3 Deluxe Suites and the 2 Presidential Suites are distinguished by the aristocratic and fine taste. Each guestroom has been designed to provide high standards of convenience and hospitality, appreciating the view of our city. It is appointed with modern amenities and facilities. Individual Air condition and heating, mini bar, room safe, direct phone line, High Speed Wifi Internet connection, working desk, direct telephone line, 220V power supply, hair dryer, bathrobe, slippers. The excellent equipment of each room covers every visitor/s need and the outstanding service constitutes a guarantee for an unforgettable stay. 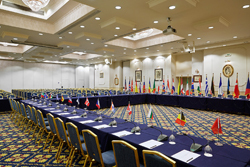 Grand Hotel Palace offers various services and facilities, covering in full the needs of the business or leisure traveler. These services include the Business Centre, an office away from the office, which provides a full range of business and secretarial services. The guests can enjoy a magnificent gastronomical trip across the globe at the award-winning Seros Prime Dining restaurant, with the restaurant's creators' unique suggestions for signature plates & cocktails of premium quality, as well as an excellent bartending service and a choice of refreshing signature cocktails in a highly-stylish area. 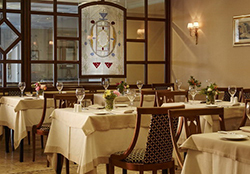 The Marco Polo lounge bar is an ideal place to meet, with atmospheric environment where guests can enjoy spirits, cocktails, coffee, and beverages. The hotel's Health and Fitness Center offers a unique experience of relaxation, revitalization. The guests can work out with the fitness equipment, relax in one of the saunas or swim in the hotel's indoor heated pool cleaned by ozone. Others facilities and services included are: concierge, laundry and valet services, indoor and outdoor parking, multilingual stuff, 24-hour Room Service, Rooms and Facilities for physically disabled guests, Nonsmoking Hotel, Health club, Indoor Swimming Pool and Shuttle Bus Service. Grand Hotel Palace, member of HAPCO, ICCA and TCB, was for the second year in a row, awarded as the Best Greek MICE City Hotel at the Greek Hospitality Awards 2018. 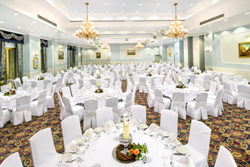 It offers a wide range of conference and banqueting facilities, suitable for large and small events, meetings and conferences for up to 3300 participants. 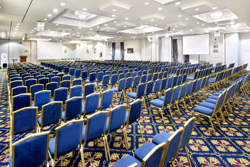 Our 13 conference halls in total equipped with the latest technological, high speed Wifi Internet, audiovisual equipment and our people who take care of every single detail offer a top quality for any kind of event. 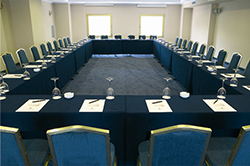 Settings include the New Conference Olympia, Grand Ballroom, Voula Patoulidou Conference Hall, Ilida meeting room, Kalipatira meeting room and 2 boardrooms.